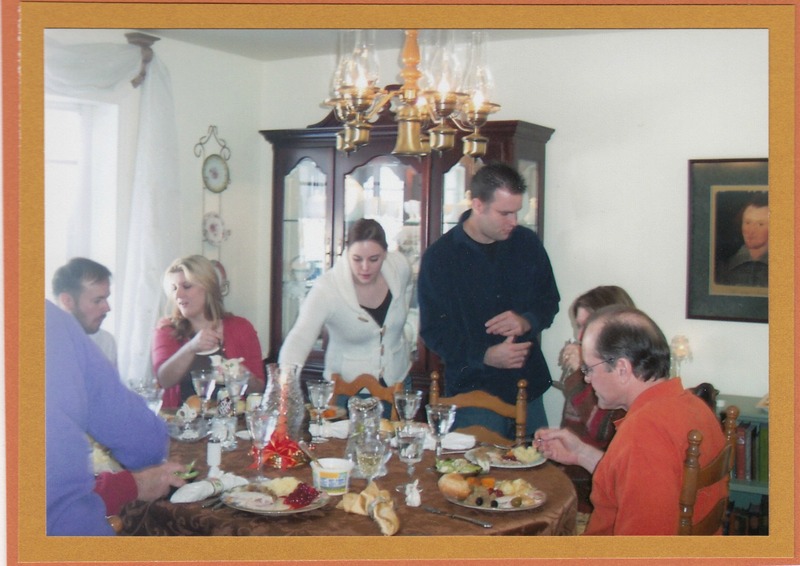 This photo is from Thanksgiving 2006, the last year I made my favorite dinner for my sons. I am thankful for all the years I had them with me, thankful they found such beautiful and kind women to love, and thankful that they are together this year. Neither Mike or Tim was married or even engaged at the time…how can that be? But they brought their future wives to this holiday meal. Jessica’s birthday is a few days before Thanksgiving, so I made a carrot cake (her favorite) for her as well as a pumpkin and an apple pie. I used to get up at 3 a.m. to make the pies so they’d be fresh. And so I could get the turkey in by 10 am or so. Things are different now. My friend Jan is bringing the turkey…and there will only be four of us at the table. But I’m making the same meal and maybe we’ll get some Face Time with the kids…Tim and Alicia are meeting Owen for the first time today! I miss them, but I feel blessed just knowing they are in the world, have their own families now, and carry on with the traditions I have always loved. For those of us in the States, I hope your Thanksgiving is wonderful, too, in whatever way you celebrate it. And for those who are alone during the holidays, or hungry, or in pain…I’m thinking about you, too, and hoping for better times for you soon. Feeling much love today for this world and the people in it. Much love and so very thankful. And I’m thankful for the dogs and cats in this world too. Especially Murphy and Bosco!